We are starting something new here at From Blacktop to Dirt Road! 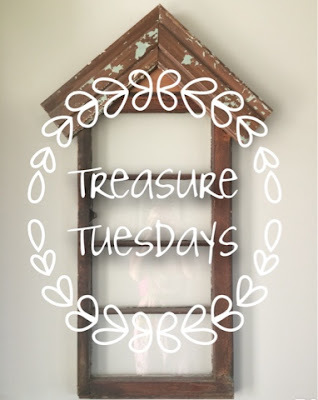 Because I love nothing more than bringing life into my home with something old and worn, we are starting Treasure Tuesdays. It’s a chance for us to do three things with the pieces we love most in our homes. 1. Remember: Every antique piece has a story. Where did it come from? Who did it belong to? How old is it? This is an opportunity to give background on your pieces. 2. Transform: Chances are your piece needed some TLC. What did you do to make it come alive? Was it in good condition when you got it? How do you take care of it now? 3. Inspire: This is the fun part! This gives you a chance to inspire other readers to find “new-old” pieces for their homes and give their rooms some character. 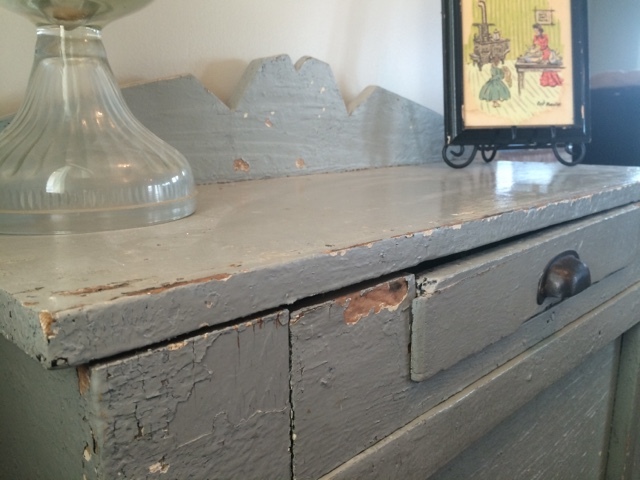 Today I am sharing about my favorite piece in our home: the entry way table. Remember: This little table is the very first antique piece I ever bought. I was with my mom at an antique store in Parkville, MO. I saw it and I swear it called my name. I was amazed at how sturdy it was for being such a small piece, but was even more surprised when I saw the price tag of $20.00!! Because I didn’t get this directly from the buyer, I am not sure of the exact age, but we have estimate that it was built sometime in the 1940’s or 1950’s. Transform: Since this was my first piece, I did not do much to it. I do know that the blue-grey paint and drawer pull are original, but the hinges and white door knob are not. Because of the original paint, I simply clean this piece with a damp cloth. 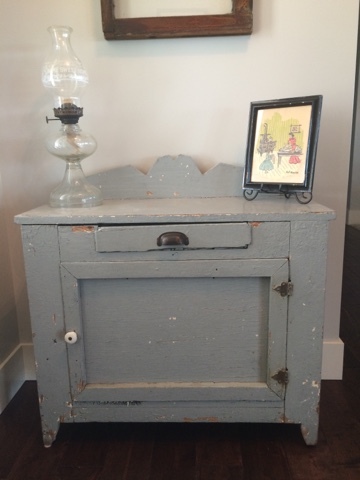 Inspire: This adorable table has been our entryway table since we first got married. I had it first in our little apartment in Kansas City, then moved it to our first house (also in Kansas City) and now it sits just inside my front door at the farm house in Nebraska. I love that it’s a shorter table, perfect for holding keys, ball caps, sun glasses and anything else that needs to be put down when you walk through the door. We keep our DVDs in the bottom cabinet so that our kids are able to go pick out movies themselves. It’s simplicity is so charming and the backboard shape on it is so unique! I have always called this piece “my baby,” since it was my first real antique piece of furniture. It’s the perfect piece that sets the tone of our home right when you walk through the front door. I will treasure it always! Today I told you about my favorite piece in my house and will continue to share the different parts of my farm home that I love the most. But what I really want is stories from YOU! Each of you have special things in your home; vintage and antique pieces that make your house tick. Maybe it’s a piece of furniture, a family heirloom, a large hanging on your wall, a small accent piece…. Whatever it is that is a treasure in your home, I want to see it and share it with everyone else! I am excited to see what all you message or email me so that we can get a glimpse into your homes! I'm Turning 30. So Thank You. What's all the hutch about?